BERJAYA Land Bhd's (BLand) landmark Berjaya Jeju Airest City project in Jeju is expected to further boost not only the company's footprint in South Korea but also the island's future as a prime tourist attraction. "Jeju Island is a hidden treasure. It has high potential of growth thanks to its strategic location and clean environment. Our team at Berjaya is committed to ensuring the success of the Berjaya Jeju Airest City resort project," said BLand chief executive officer Datuk Francis Ng Sooi Lin at the launch of the Berjaya Jeju Airest City Promotion Centre at the Boutique Monaco Museum, Gangnam, here, yesterday. Also present were Jeju Free International City Development (JDC) chairman Byon Jong Il, Jeju Special Self-Governing Province Investment Inducement Department director Moon Young Bang, media representatives from Malaysia and South Korea and more than 100 guests. 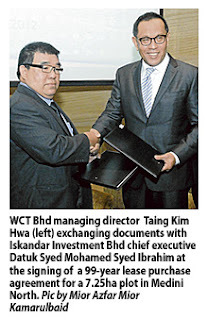 Berjaya Jeju Resort (BJR) is a joint venture that has been formed to oversee the Berjaya Jeju Airest City project, which has a gross development cost of around US$2.4 billion (RM7.32 billion) and a total gross development value of US$3.2 billion. BJR is 72.6 per cent owned by BLand with the remaining held by Jeju Free International City Development (JDC), a government agency, at 19 per cent and Swan Street Partner LLP at 8.4 per cent. So far, BLand has invested about US$140 million in the project, which is one of the largest foreign direct investments in South Korea's tourism industry. The 74.4ha Berjaya Jeju Airest City is an integrated resort located by the coastline of Yerae-dong, Seogwipo City on Jeju Province. Once completed, the site will boast of a 45-storey Landmark Tower, a casino hotel, a massive retail and shopping mall, a medical centre and entertainment and sports facilities. Infrastructure works at the entire site have been completed, with Phase One of the project, the Gotjawal Village, set to begin by year-end. The Gotjawal Village, which will cost US$250 million, comprises a 230-key five-star hotel, the upscale Seaside Maison and the Market Walk. Seaside Maison will have 51 units of villa-type condominiums while Market Walk will have 96 units of low-rise commercial and residential condominiums. 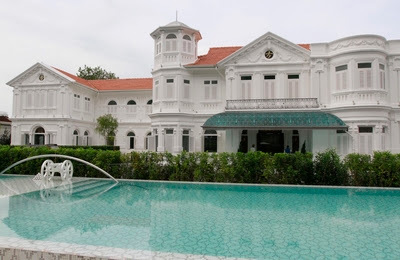 At almost US$1,000 psf and sizes of up to 3,000 sq f each, they may well be some of the most expensive but exclusive real estates in the country. "Gotjawal Village is located on the 'best stretch' of the Berjaya Jeju Airest City. 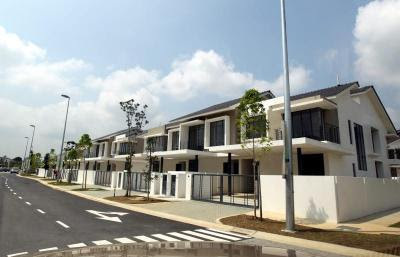 Therefore, we are very confident of achieving a 25 per cent minimum return on our investment once it is completed," said Ng during a visit to the site of the Berjaya Jeju Airest City in Jeju on Thursday. "We have received many enquiries regarding those units. Some of the designs are eccentric but this is apparently what the buyers wanted, especially those from Seoul," said Ng. "We can't start selling the units yet until we have completed at least 20 per cent of the sub-structures of the Gotjawal Village, and I estimate that is in about three to four months from now. "Also, as a further incentive, those who buy properties in Jeju will be granted a five-year visa and, after that, permanent residence status for themselves and their immediate family members," Ng added. BLand senior general manager of properties marketing Mah Siew Wan said the company has conducted indepth studies as to why people would want to come to Jeju and what it has to offer. "The result is that the people want something different," she said. "And we are giving them something different and unique." 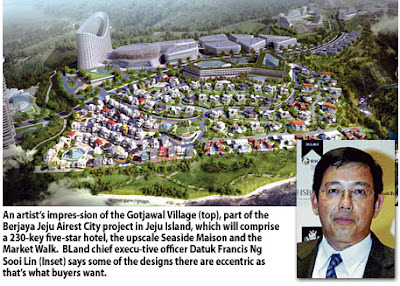 The Gotjawal Village is the first of up to eight phases of the the Berjaya Jeju Airest City project, which also include plans for a medical centre, a shopping mall, a casino, a five-star resort hotel and the 45-storey Landmark Tower, the tallest building on Jeju Island once it is completed. On the next step after the Gotjawal Village, Ng said BLand plans to develop either the casino hotel or the medical centre. The Berjaya Jeju Airest City project is expected to generate almost 4,000 jobs upon completion within the next five years. And this will be good news for the JDC, too, for it has been tasked with bringing development to the island and improving the livelihood of its population of 565,000 people. Its investment strategy department director, C.M. Lee, said plans are afoot to bring the size of the population up to one million within the next five years. As part of that initiative to develop the Jeju Free International City, the "special corporation" has implemented six strategies that called for the creation of a global education city, a healthcare town, a science park, a Myth & History Theme Park, a tourism port and a residence resort complex, of which the Berjaya Jeju Airest City is part of. "We have attracted the North London Collegiate School and the Branksome Hall of Toronto to set up branches here. We are also in the midst of setting up a hospital offering quality services, including plastic surgery, which South Korea is famous for," he said with a laugh. A science park that is tailored after the Multimedia Super Corridor in Malaysia has also been set up with the vision of utilising local biodiversity and green resources to foster knowledge-based industries. 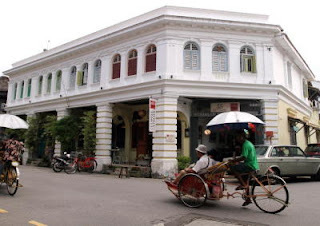 The number of tourist arrivals have been on a steady increase over the past decade, especially those from Southeast Asia. JDC is confident that with the various available incentives, more tourists and foreign investors will flock here. And this certainly bodes well for BLand's massive endeavour on Jeju Island.